If you can dream it, we can build it! 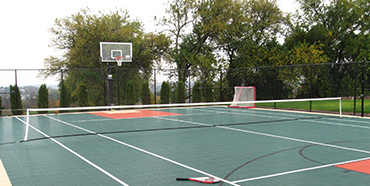 For over 40 years, we, at Sport Court, have been providing Residential Court Building in Pittsburgh. From basketball courts to tennis courts to home gyms and much more, we work with you to make your dreams a reality. Each of our courts is tailor-made to suit your family’s sporting needs. No two courts are ever the same—you decide on the court size, set-up, colors and accessories. By hiring Sport Court of Pittsburgh, you are only dealing with one company for the designing, purchasing, excavating, concrete pouring, installing, landscaping and maintenance of your outdoor court or indoor gym. We make it simple, and provide the best value, so that you can focus on the game. You want the best for your family, which means keeping them safe. Sport Court’s technology provides a surface that delivers the best combination of shock absorption, ball response, traction, and playability. If you value your family’s fun and safety, look to Sport Court of Pittsburgh for all of your backyard needs. PowerGame™ suspended sports surfaces reduces the likelihood of head injuries and concussions. Meanwhile, Sport Court’s patented Lateral Forgiveness™ technology reduces wear and tear on joints and muscles from active play, so athletes of all ages can keep playing longer. And the list doesn’t stop there. The possibilities are truly endless. 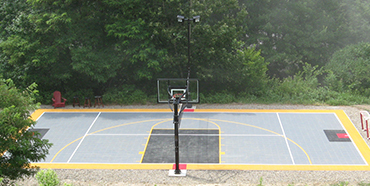 If you can dream it, Sport Court of Pittsburgh will work with you to build it! Contact us today at 412-224-0639 for our residential court building in Pittsburgh.